FOR THE FIRST TIME EVER OLIVER PEOPLES ALLOWED THE ROW TO RIFLE THROUGH IT'S ARCHIVES, AND SO WAS BORN THIS LIMITED EDITION CAPSULE COLLECTION BETWEEN TWO OF THE CHICEST COMPANIES TODAY. OLIVER PEOPLES X THE ROW IS A CAPSULE COLLECTION CREATED BY TWO LIKE MINDED COMPANIES WITH SIMILAR AESTHETIC PRINCIPLES AND A BELIEF IN SIMPLICTY AND EFFORTLESS DESIGN. 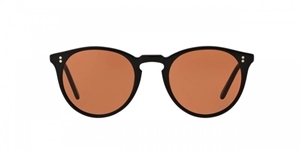 THE COLLECTION IS THE FIRST TIME OLIVER PEOPLES HAVE ALLOWED COLLABORATORS CHOOSE FROM THE ARCHIVES AND PUT THEIR OWN STAMP ON A CURRENT OLIVER PEOPLES FRAME THE O'MALLEY.